What a lame title for such a surprisingly original and interesting movie. 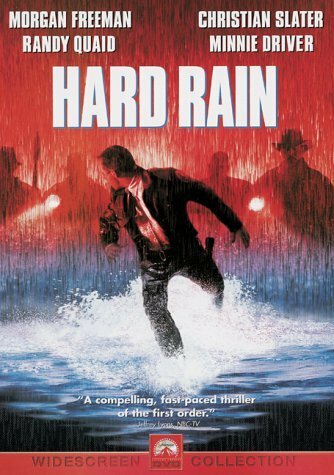 I mean, come on, hard rain is the first thing that they thought of (actually second), but enough about the title and lets talk about movie. First of all, it still looks good and believable after 14 years, meaning that a relatively big budget payed off. This also means that we got some very good actors like Morgan Freeman and Christian Slater, with an excellent supporting cast. The main thing about Hard Rain, and the feature that makes it unique is the water, lots of water. 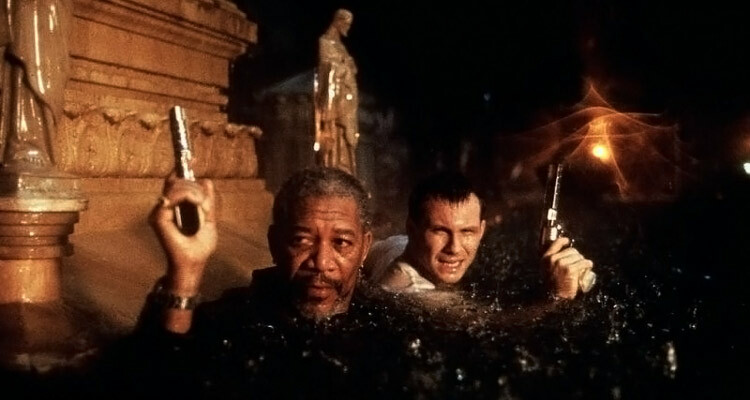 This single idea of an almost sunken city combined with a heist plot and good directing created a very exciting and original thriller. It is very interesting to watch characters in situation where the rule of law is somewhat suspended, and where it’s every man for himself. With Morgan confidently leading and Slater opposing him with some fervor this is a heist movie with a twist that is fun to watch even on a second viewing. Enjoy. Fun Facts: At the time it was filmed, the movie had the largest painted scenic backdrop ever used in a film.